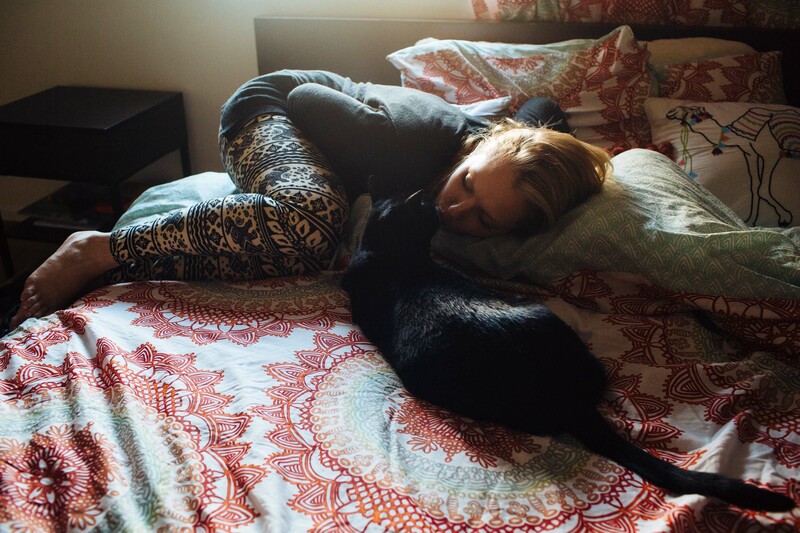 SILVER SPRING, MD, USA - MAY 26, 2016 : Alex lies on her bed and kisses her cat, named "Bear," on the nose. It has been three years since she last used heroin, and a year since her felony record was expunged. She now works full time, and is working toward getting her college degree. She earned her GED while in jail. She and Kyle have decided to take end their relationship, and she lives in an apartment with a roommate and her cat. She says she wants to work toward becoming a drug counselor. Heroin is a huge industry in Baltimore, as it is in many post-industrial towns and cities in the United States. It has seen a huge resurgence in popularity over the last decade, due in great measure to the availability of prescription opioids like oxycontin, which is often a gateway drug. According to the Centers for Disease Control, in 2002, 100 people per 100,000 were addicted to heroin but that number had doubled by 2013. Rates of addiction in the Northeastern United States have increased dramatically, only slightly outpaced by addiction rates in the Midwest, with the highest addiction increases being reported amongst 18-25-year-olds. The rate of heroin-related overdose deaths increased 286 percent between 2002 and 2013. This photograph was unposed and undirected by the photographer and shot on assignment for Stern Magazine.